Apple is pushing out the latest version of its desktop operating system, macOS Sierra, later on today. Following the release of iOS 10 last week, macOS Sierra will be made available for download and installation at some point in the course of the day. Usually, it's around teatime for us over here in the UK, or maybe slightly later in the evening (due to the time difference with the US – it should come out in the States around 10:00 PDT, 13:00 ET, which is 18:00 BST). On the software front, you'll need to be running at least OS X 10.7.5 (Lion) or better, and you'll also need to have at least 8.8GB of free space on your drive. 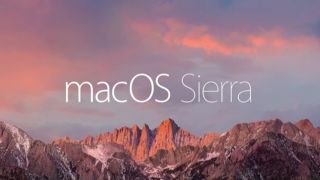 If you're running an older OS, you'll have to upgrade to a newer version before you can then subsequently install Sierra. Later on, when macOS becomes available, you'll see it on the Mac App Store – you can find full instructions on how to download and install the OS in our guide here (note that as of the time of writing, this is instructions for downloading the final release candidate, as the full and finished version isn't out just yet, as mentioned – we'll be updating the article shortly). So what can we expect from macOS Sierra? The most obvious fresh addition is the inclusion of virtual assistant Siri on the desktop, and Apple is also making a big thing of tying its desktop OS and mobile OS closer together in general. So there's now a Universal Clipboard to allow users to cut and paste between iOS and macOS devices. And you'll also be able to use your Apple Watch to unlock your Mac just by being near the machine, which is a pretty nifty and convenient improvement on the security front. The new OS also boasts an upgraded file system, and picture-in-picture capability, the latter meaning you can, for example, take a video playing in Safari and 'float' it over your desktop so you can keep watching it with one eye while doing something else with an app. There are the usual updates to the main apps such as Messages and Photos, plus some other nifty tricks like Optimized Storage. The latter helps keep your drive free of junk files so you have more space, plus it will actually shift infrequently used files to iCloud where they can be accessed on-demand. That will definitely help those with Apple laptops that don't have so much storage space. It's also worth noting that Apple Pay is now supported on the web, and macOS Sierra users are able to benefit from this added functionality in Safari – although bear in mind that you'll need to authenticate any purchase via a hook-up with an iPhone 6 (or later) running iOS 10 or an Apple Watch with watchOS 3 on board. If you want to read up more about the fresh features Sierra is introducing, then check out our full round-up of them all here. And stay tuned for our full review of macOS Sierra which will be going live later today.